I just sat and looked at Makenzie today for a long time. I do this quite often. She is such an amazing little girl. Even though life is hard she just smiles and is so happy all the time. She can not walk, talk, or eat but still manages to light up any room she is in. Some times the day to day stuff gets her mommy down but yet she smiles. Some times her mommy is full of fear and frustration, but yet Makenzie smiles. When it feels like the world is out to get her, she is still smiling. Makenzie's smile makes it really hard not to focus on the joy in life even when it feels like the world is crashing down around you. While I was staring into my daughter beautiful blue eyes today I realized that I see a little girl who can do so much. A little girl that understands EVERYTHING. A princess that has the most pure heart of anyone I know. I started thinking about the day when I focused on what Makenzie couldn't do. I wanted to fix it. I had to fix it. I couldn't fix it. Today I still fight for Makenzie. I will continue the fight forever but I am realizing more and more every day that I am able to stop and smell the roses a bit more. 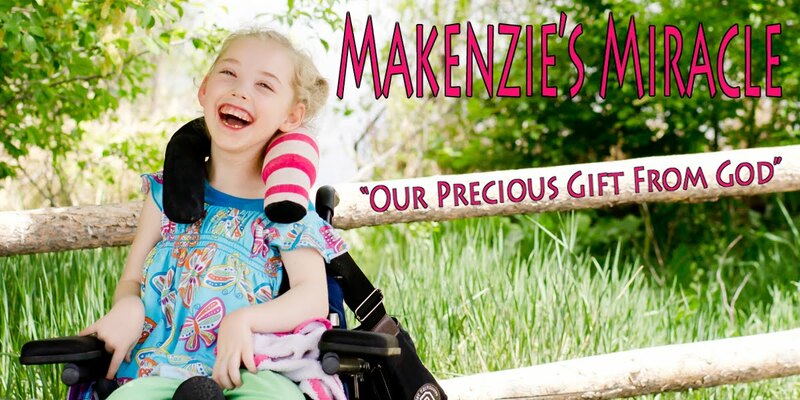 I am able to relish in the things that Makenzie can do more then the things she can't. It feels good! Makenzie continues to heal and improve. She can do so many things that I wasn't sure she would ever do again. I stand in amazement. My but was that Makenzie still isn't moving, sitting, or crawling. I said I feel like we are in a holding pattern. Before I could speak one more word my friend stopped me.. looked me straight in the eye and said... it will come... she is way to smart to just lay there forever... Makenzie will figure it out. Yes, Yes she will and I need to be more patient. I need to be still and lean on God's promises to Makenzie and this family! It will come. So I stop, stare into those big blues and see a little girl who is almost 5 years old and relish in what she can do because it is more then words can ever express! And then Princess Makenzie smiled! She is so beautiful and precious and she is so lucky to have you, and you are so lucky to have her!